Good(e) Bridal Business Bootcamp Certification is a workshop series for salons, freelancers, hair stylists, makeup artists and beauty professionals. The certification works through a series of programs to help creatives build a solid foundation to grow from and enhance skills to an expert status. Become a badass bridal business babe! 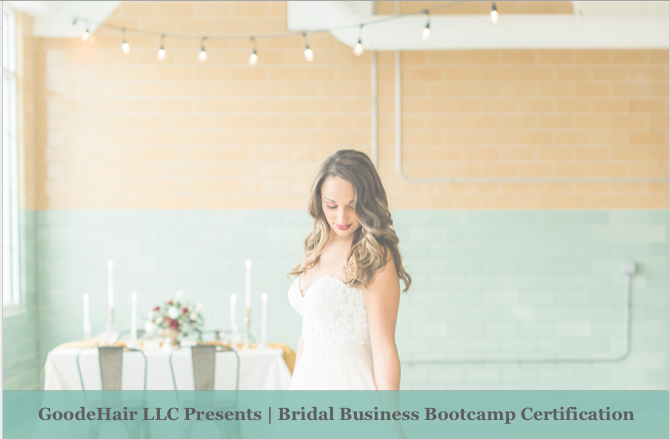 What is the Bridal Business Bootcamp Certification? Are you a hair stylist, makeup artist or salon who wants to grow your wedding and bridal business? If you are, this certification is for you! This certification is structured to build upon your skills in hair styling and/or makeup artistry. Our technique sessions/workshops are in person, side-by-side, one-on-one with the coaches from Good(e) workshops. We are fully invested in your success in updo creation and/or beautiful bridal makeup. Our coaches will help you to be an expert in your community! This certification also tackles all of the back end, behind the scenes business. We work closely with members of the Bridal Business Bootcamp to build all the necessary tools to work efficiently and professionally. The behind the scenes side of a creative business can be complicated. However, we are here to make it easier. From creating email templates, creating seamless consultations, websites, marketing, social media, professional profiles, working with a team, contracts, correspondence, creating a mission and vision, portfolio building, community building, navigating pricing, learning best practices for wedding parties, speed & efficiency, more bookings, building confidence in your pricing & worth, networking necessities, …the list goes on and on. Want to stand out next to your competitors? We will show you how. We are fully invested in your success and cannot wait to get started! Learn how to fill your calendar with weddings! This is your opportunity to learn all of our secrets! We are ready to share all of our tips and tricks with you. Book Your First One-on-One with an Award Winning Coach!